COMT & Dopamine: The Delicate Brain Balance! Home/COMT & Dopamine: The Delicate Brain Balance! Brain Balance is a key phrase to consider in COMT (Catechol-O-methyltransferase). 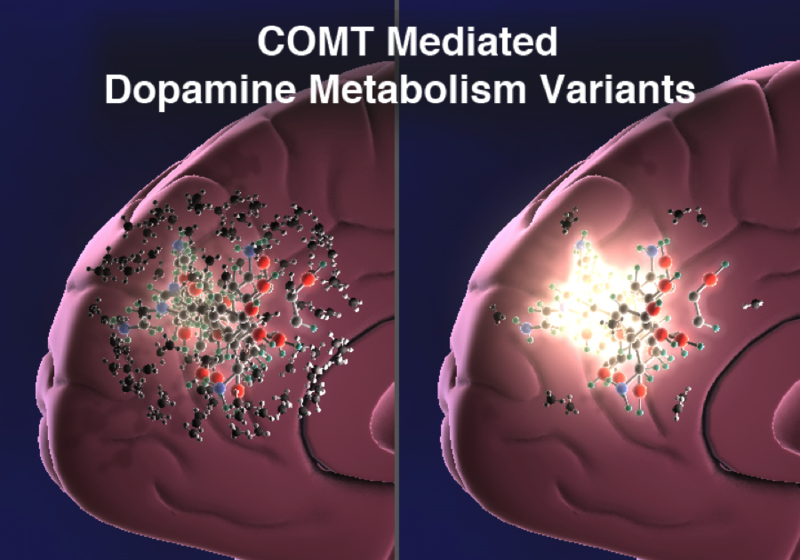 COMT and Dopamine receptor activity and is crucial in the methylation process as well. Moreover, the brain is influenced by small changes in COMT / Dopamine receptor expression, which can profoundly influence dopamine receptor clearance and influence stability of mood and other neuroregulatory disturbances associated with behavior changes. COMT (catechol-O-methyltransferase) was discovered in 1958 by Axelrod and Tomchick, is an important enzyme in catecholamine biochemistry and pharmacology and, more recently, in genetic mechanisms of variation in catechol metabolism and its clinical implications. COMT catalyzes the transfer of a methyl group from S-adenosyl-methionine (SAM) to a hydroxyl group on a catechol nucleus and influences dopamine, norepinephrine and catechol estrogen. Genetic variation in COMT has been associated with diverse clinical conditions from anxiety to estrogen-related cancer and it has been studied particularly extensively in relation to risk for schizophrenia and neurodegenerative disorders including Dementia, Parkinson’s and Alzheimer’s disease. A key question I am often asked is; how is COMT evaluated? The only way to really evaluate COMT is by including health history particularly involving any mental health changes (depression, mood instability, memory, sleep, failure to adapt to stress easily, brain fog, etc.) and looking at gene / snp variations. Unfortunately, the only for sure way right now to get actual factual and clear data on COMT and Dopamine is on postmortem evaluation. I would suggest that brain COMT is very sensitive to small changes and plays a critical role in dopamine action in the prefrontal cortex. It also plays a crucial role in methylation cycle and it is a delicate cycle. I would also suggest that caution be exercised when trying to interpret gene / snp variants. Do not run to extremes! MTHFR, MTRR, MTNRB1, HT2RA, CBS, BHMT and COMT all come into play regarding balanced brain activity and healthy neurotransmitter action. Another key player is TRPM6 involving magnesium transient receptor cation in COMT enzyme action. Disturbances in methylation can profoundly influence stability of COMT / Dopamine receptor expression causing fluctuations to either extreme. Magnesium deficiency and metabolism, as well as, methyl donor stability can cause disturbances. As you can observe, COMT / Dopamine receptor expression is not a simple evaluation. When evaluating COMT and Dopamine receptor, personal history particularly in the area of brain health with reference to mood disturbances and behavioral changes are crucial. Also, there may be predictive patterns that are observed in family history as well. I highly recommend when evaluating brain and neuroendocrine health not isolating any single gene / snp variant. There may numerous effects on pathways and wrongful conclusion can be made. HealthCoach7 system takes into consideration related pathways to give a better relational survey taking into account factors that would create disturbances on COMT / Dopamine receptor function. Mast Cells / Histamine: Friend or Foe!? I experienced an episode of high dopamine leading to a psychosis. I agree that antipsychotic medications cause more problems than they solve. Interestingly, whilst my brain reached psychosis which involved a bunch of meaningless associations and delusional beliefs at the time I also had a short period of time where I developed savant like abilities which went away when my dopamine levels fell back down again. I am convinced that this was not a part of the psychosis but of course no one believes me, labelling it as another delusion.